It’s common knowledge that dancing is a great form of exercise, offering cardio benefits as well as training in flexibility and balance. But studies have recently proven another, less expected benefit. This isn’t the fabrication of some dance studio PR firm; it’s hard science. The New England Journal of Medicine recently reported the results of a 21-year study on mental acuity in adults 75 and older. The study was led by the Albert Einstein College of Medicine in New York and funded by the National Institute on Aging and was designed to monitor the effect that various activities had on rates of dementia, including Alzheimer’s disease. A wide variety of activities were measured, from tennis to studying French to playing the saxophone. Surprisingly, while some of the cognitive activities, such as solving puzzles, helped people ward off dementia-related illnesses such as Alzheimer’s, none of the physical activities offered the slightest protection. None, that is, except for dancing. Dancing frequently: 76%. That was the greatest risk reduction of any activity studied, cognitive or physical. Why is dancing so particularly effective in keeping seniors mentally sharp? Researchers believe it is because dancing requires the mind to constantly learn new steps, remember old steps, and yet simultaneously be in the moment, responding to the rhythm of the music and the movements of one’s partner. In other words, dancing “lights up” many areas of the brain at once, forcing it to recall old information and respond to new stimuli quickly. In essence, when you dance, you’re rewiring your cerebral cortex. Your brain is not only working, but working hard, creating new neural pathways and being challenged in a manner that it perhaps hasn’t been in years. The bottom line is that over the 21 years of The Council on Aging study, only 19% of study participants who danced frequently (three or more times a week) showed signs of dementia. Of course the advantages of dance extend far beyond reducing your risk of dementia. A range of cardiovascular benefits kick in, and dancing builds muscle, improves coordination, and —especially vital for seniors—enhances balance. Dance is also an inherently social activity, allowing you the chance to interact with your partner or within a group. And perhaps the most important benefit of all is that dancing is a natural mood elevator. The combination of the music, the physical activity, socializing with friends, and the sheer fun of dance all combine to boost seratonin levels in the brain. So you’re not only smarter, you’re happier too! You say you’re not a natural twinkletoes? Not to worry. The benefits of dance are just as pronounced in beginners who are lead-footing their way through a salsa class as for seasoned professionals (or perhaps even more so, since the beginner brains have to work harder to keep up). Nor does the type of dance you choose appear to matter. The hip-hoppers gained the same benefits as the Lindy Hoppers. Put down that crossword puzzle, that broom or that tuba, and pick up your dance shoes. Your brain will thank you for it. From the author of the critically acclaimed debut Love in Mid Air comes this moving novel about a middle-aged widow who finds her feet by embracing a new hobby: ballroom dancing. 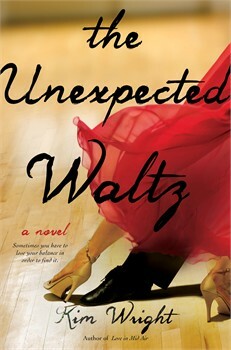 In the vein of Jennifer Weiner's novels, Unexpected Waltz is a deeply felt story about moving on after loss and finding a new walk—or dance—of life through the power of second chances. Kim Wright is the author of Love in Mid Air and has been writing about travel, food, and wine for more than twenty years for many magazines, including Wine Spectator, Self, Travel & Leisure, and Vogue. She has twice won the Lowell Thomas Award for travel writing. This is her second novel, and she also ballroom dances competitively. Kim lives in Charlotte, North Carolina. Share Could Dancing the Night Away Ward off Alzheimer’s?